Two veteran high school art teachers present web technologies that are effectively used to facilitate collaborative learning between schools. As content creators themselves, these teachers utilize a thematic approach to curating web content for use as instructional resources for guiding students in creating their own research based art works. The process of designing, implementing, assessing, revising and repeating is best practice for teachers. In this session participants will see how to harness the power of social media like Pinterest, Scoop.it, Instagram, Twitter, Facebook and many more. These teachers guide their high school art students in discovering the academic and creative possibilities of contemporary web technologies. Participants in this session will see exemplary student artwork examples created through collaborations across state lines as a result of becoming curators of art and web content creators. Participants will also receive lesson plans, rubrics and other instructional materials for use in their own curriculum. This session will share how a camera, collaboration, and a computer can open student dialogues about things that matter in the world. Separated by geography, students utilize emerging and traditional media to inspire each other, identify and explore issues of social justice in the world today, take a stance, and create art that matters to them and their community. Presenters share how their students use a variety of cameras, digital software and traditional art making media to create visual commentaries about world issues. The process of investigating issues of social justice leads students to create marketable posters to inspire social responsibility and stewardship. Participants will learn how to connect students virtually by utilizing social networks such as blogs, Pinterest, Skype, Twitter, Instagram, and Facebook to collaborate and create art. A panel of veteran teachers will share how they utilize the power of prompts in the art classroom as powerful tools for jump starting creative thinking and visual problem solving. Using prompts in the contemporary art classroom has proven to be invaluable for student learning. Allowing students to discover their own direction for art creation is the key for developing creative and divergent thinking. Effective problem solving requires the kind of higher order thinking skills that are developed by utilizing prompt driven exploration. Prompts can be used for everything from sketchbooks and journaling to summative projects and creative discussions. This session will share how high school art teachers from across the country use prompts in their classes to engage students in the creative process. 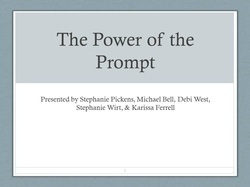 Presenters will show examples of successful student prompt driven work. Session participants will also be provided with ready to use instructional resources adaptable for implementation in their own art classroom. Two high school art teachers share how social media networks are effective teaching tools for engaging the high school art learner. Social media networking transforms high school art education when it goes beyond status updates to becoming personal learning networks. 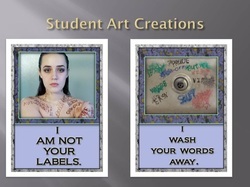 Two veteran high school art teachers present how using social media and artist networking sites enhance art instruction and engage the 21st century high school learner. As content creators and users, these two teachers have discovered the world of free instructional resources through collaboration in digital communities of practice. With a DIY mentality for the creation of instructional resources and developing collaborative student art communities, these two teachers show how they harness the power of the internet to bring the global world of art into their classrooms. When social media networking transforms into personal learning networks in high school art education new communities of learners are created. 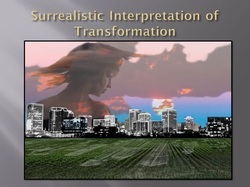 Click here for the full power point presentation. Click here for the short version. Three art teachers share how being in global online communities enriches our practices. Highlights include how we use social media sites and technology resources, and how this impacts student art making. In schools filled with multiple Math, Science, History and English teachers, the single Art teacher is sometimes isolated in the classroom, lacking creative, professional, and intellectual development opportunities. Yet, as demonstrated here, entering the virtual classroom (the Internet) through our computer screens or handheld mobile multimedia electronic communication devices opens the door to a large, vibrant, creative online global community of art educators who are creating, sharing their work, collaborating across great distances, and learning from and with one other! This presentation provides four different glimpses into how our participation in these online communities of practice (both as content creators and as content users) enrich and extend our creative and professional lives as artist/teachers. Highlights include how we use social media sites and free online technology tools and resources in our curricular design and how this impacts our student art making. Sharing of exemplary student art works conclude the presentation.